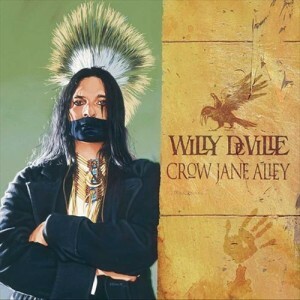 Crow Jane Alley is an album by Willy DeVille. It was recorded in 2004 in Los Angeles. For this album, DeVille was joined by members of the Chicano rock band Quetzal, David Hidalgo of Los Lobos, and Peruvian Afro-Cuban jazz drummer Alex Acuña, among other prominent musicians. Crow Jane Alley was produced by John Philip Shenale, the third album Shenale produced for DeVille. Credits: Alex Acuña Cajon, Cajon Drums, Castanets, Cowbell, Guiro, Main Personnel, Maracas, Shaker, Stick, Tambourine, Timbales; Diego “La Empanada” Arellano Guitarron, Main Personnel; Martin “Baby Face” Arellano Biguela, Guitar (Acoustic), Main Personnel, Trumpet; John Carter Engineer, Mixing; Augusto Cesar Main Personnel, Unknown Instrument; Willy DeVille Composer, Guitar (Acoustic), Main Personnel, Primary Artist, Producer, Slide Guitar, Vocals, Vocals (Background); Wes Farrell Composer; Bryan Ferry Composer; Quetzal Flores Bass, Jarana, Jawbone, Main Personnel, Various Instruments; Lenin García Arranger, Guitar (Acoustic), Main Personnel; Castro Gonzalez Main Personnel, Unknown Instrument; Martha González Cajon, Cajon Drums, Main Personnel; Bobby Hart Composer; Hook Herrera Harmonica, Main Personnel; David Hidalgo Accordion, Bajo Sexto, Main Personnel; David Keyes Bass (Electric), Double Bass, Guitar (Bass), Main Personnel, Vocals (Background); Alfons Kiefer Cover Art, Illustrations; Ron McMaster Mastering; J. Mario Rodriguez Main Personnel, Violin; John Philip Shenale ARP Synthesizer, Assistant, Audio Production, Chamberlin, Chord Organ, Loops, Main Personnel, Marxophone, Mixing, Organ (Hammond), Percussion, Piano, Piano (Electric), Producer, Sampling, String Ensemble, Strings, Synthesizer, Unknown Instrument, Wurlitzer, Wurlitzer Piano; John Sklair E-Bow, Guitar, Guitar (12 String), Main Personnel; Josh Sklair E-Bow, Guitar, Guitar (12 String Acoustic), Guitar (Acoustic), Guitar (Electric), Guitar (Nylon String), Pedal Steel; Michael Starr Main Personnel, Mandolin, Strumstick, Unknown Contributor Role, Violin; Steve Stevens Drums; Steve Stevens Drums, Main Personnel; Billy; Valentine Main Personnel, Vocals (Background); John Valentine Main Personnel, Vocals (Background); Joey Waronker Drums, Main Personnel.